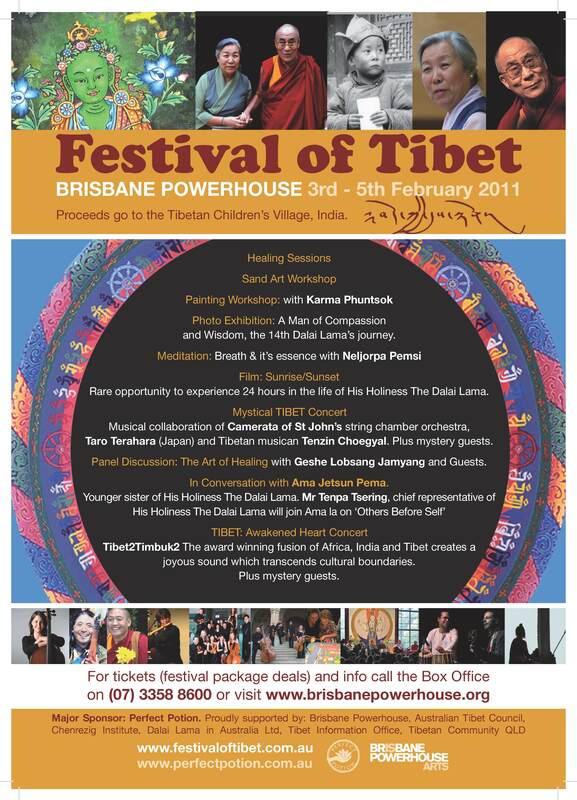 Click below for Sydney Festival of TIBET program. Brisbane Festival of TIBET was a GREAT one thank you to all who came and made it an amazing Festival… Please click the above to Sydney details. FESTIVAL OF TIBET – a five-day festival that will engage the senses in a celebration of the unique music and sacred arts of Tibet. The Tashi Lhunpo Monks of Tibet will create a stunning medicine Buddha SAND MANDALA and renowned artist Karma Phuntsok will exhibit his cutting edge contemporary Tibetan Paintings. A Discussion Panel featuring prominent environmentalists on “Climate change on the roof of the world: Why Tibet matters” will allow a stimulating exchange on the importance of protecting Tibet’s fragile environment. Kuzho Lama Geshe Tashi Tsering will give a public talk on ‘Seed of Compassion: The Art of Happiness.’ Each evening concludes with a different themed concert featuring Tenzin Choegyal, Tashi Lhunpo Monks of TIBET, The Australian Voices (prominent choral group), Trikaya (The Tibetan Book of the Dead) and Camerata of St John’s (string orchestra). You will have the opportunity to join in a number of workshops throughout the festival. 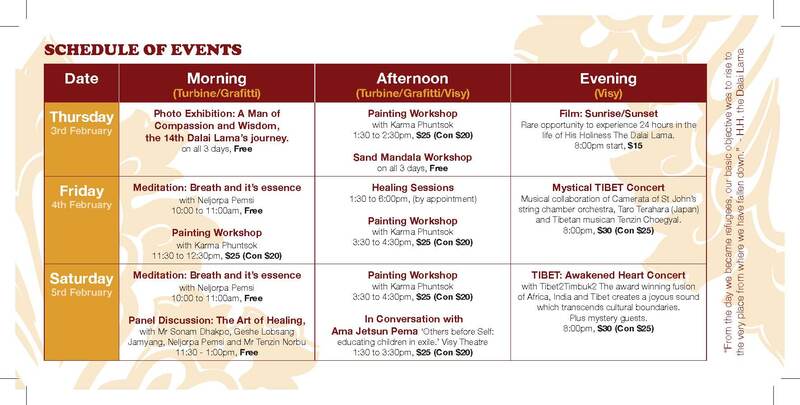 Paint your own Buddha with Karma Phuntsok, Tibetan Healing Mantra, Sound Healing, Tibetan Ritual Dance, Why Tibet? Grassroots Workshop and the Art of the Sand Mandala. Please join us to celebrate this Festival of Tibet. please click the links to print your 2011 festival guides. Proceeds to Tibetan Children’s Village in Dharamsala, India. Proudly Supported by BRISBANE POWERHOUSE, AFX Digital, AUSTRALIA TIBET COUNCIL, Tibet Information Office (Canberra), Chenrezig Institute. Ever wanted to take action for Tibet but don’t know where to start? Australia Tibet Council works alongside the local Tibetan community to promote the human rights and democratic freedoms of the Tibetan people and encourage a peaceful and lasting solution to the Tibetan situation. Whether you have one minute or one hour to spare a day, there are many simple but effective things you can do to help. This workshop will be an opportunity to meet others who care about Tibet and will introduce participants to some of the ways we can all help create a better future for the Tibetan people. Join the monks from Tashi Lhunpo for a special meditation experience. Practicing meditation which calms the mind involves the elimination of inner and outer distractions and overcoming of afflictive emotions. In a state of calmness the mind is capable of achieving equanimity, peace and clarity and with practice the potential for these capacities is limitless. This session will offer a general understanding of effective meditation and methods to create a mind which is stable, calm and alertly clear. Join Michael Askill and participate in a sound healing workshop using his extensive collection of Himalayan singing bowls and Chinese gongs. Michael has spent the past twenty–five years quietly but effectively carving a niche for himself as performer, composer, musical director and recording artist. In 2001 he was the Musical Director of a special concert for HH Dalai Lama held in the Concert Hall of the Sydney Opera House. Cham or sacred dance is a feature of many Tibetan festivals. This ancient dance possesses many levels of meaning and is seen as a practice for purification and overcoming negative obstacles. It is said the great religious master Padmasambhava first performed the dance to purify the ground for the building of Samye monastery. Accompanied by monks using traditional Tibetan instruments, the Cham dancer performs solemn movements passed on in oral instruction from master to student.The dance is like a “meditation in action”. Each gesture has significance, creating a sacred space where the dancer concentrates on specific centers and chakras throughout the performance. Come spend time with master painter Karma Phuntsok and learn some simple techniques of Tibetan Painting. This is a once in a lifetime opportunity. The art of Karma Phuntsok is a unique and dynamic expression of contemporary Buddhist Art. The startling beauty and richness which graces his work is influenced by his diverse life experiences: from a childhood in Tibet under Chinese oppression to life as a refugee in India; his love life in the Australian Bush, and the veneration with which he holds His Holiness the Dalai Lama. Internationally acclaimed, Karma’s work is scattered throughout the world, in private collections and galleries, and in Australia at the Art Gallery of New South Wales and Queensland Art Gallery. Create your own Buddha with Karma’s assistance. No experience required. Simple, step by step process. Leave with a finished Buddha, ready to hang on your wall. Mantras are energy-based sounds, which produce vibrations in the Universe. “Mantra” is derived from two Sanskrit words. Man for Mind and Tra for “to protect or to free from”. Saying any word produces an actual physical vibration. When we know what the effect of that vibration is, then the word may come to have meaning associated with the effect of saying that vibration or word. Participants in these workshops learn about the meaning and history of the sand mandala. The Tashi Lhunpo Monks will share their knowledge of the traditional techniques using the small metal funnel known as the chak phur to create designs with coloured sand, allowing everyone to experience the beauty and challenges of the art form. “Climate Change on the Roof of the World: Why Tibet Matters” will bring together five of Australia’s most eminent researchers, campaigners and spokespeople on Tibet for a fascinating live discussion set to shed new light on the importance of Tibet to the future of our planet. The panel will explore the tremendous significance of Tibet, the earth’s “Third Pole”, to the global environment and why the Tibetan people and Tibetan culture are a critical part of the solution to environmental challenges afflicting China, Asia and the wider world. Hon Peter Slipper MP, one of the most consistent, longstanding and effective advocates for Tibet in the Australian Parliament, will be joined by Mr. Sonam Dagpo, Australian Representative of His Holiness the Dalai Lama, Former Democrat Senator for Queensland Andrew Bartlett, Assoc. Prof. William Grey of the University of Queensland, Tibet campaigner Dr. Simon Bradshaw and Geshe Lobsang Jamyang from Chenrezig Institute. 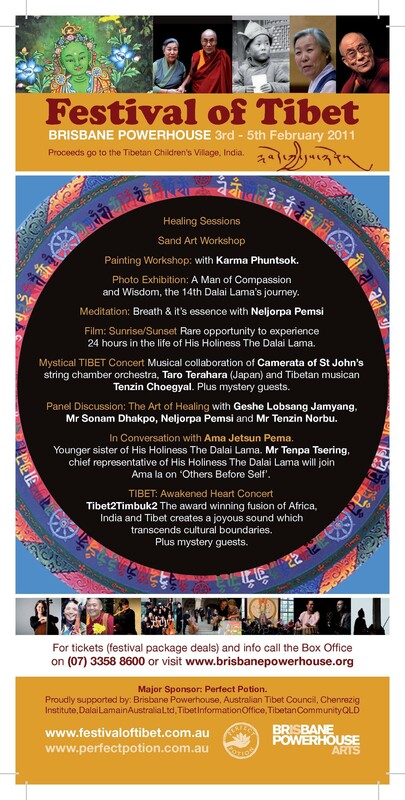 The Healing Mantra Concert brings together The Australian Voices, Tashi Lhunpo Monks of TIBET and Tibetan musician, Tenzin Choegyal in a concert that will include singing Mantras to create thought energy waves, bring peace to the mind through self realization and connect us to our subconscious mind. Mystical Tibet Concert brings rarely seen sacred dances and chants of The Tashi Lhunpo Monks of TIBET and evocative and haunting musical collaboration of Brisbane’s string chamber orchestra, Camerata of St John’s and Tibetan musician, Tenzin Choegyal. Camerata of St John’s a group of talented, professional Australian string players. Performing without a conductor, Camerata is known for its verve, stylish presentations, and innovative programming. Acclaimed performances provide enduring and treasured memories for its dedicated audience, players and guest artists. From its home in the heart of the emerging cultural city of Brisbane, Camerata adds a refreshing perspective to the nation’s artistic life. Tenzin Choegyal‘s voice and musical talents are unique and mesmerizing. Tenzin draws on his traditional Tibetan roots to create original compositions which express his devotion to his cultural heritage. 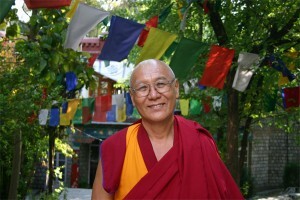 Recently at a US concert, a listener described hearing Tenzin Choegyal sing live as ‘heaven on earth’. His voice and music however are only part of his story. Tenzin was born in Tibet, escaped to Nepal and was raised in exile in Dharamsala, India. As a child, Tenzin would listen to his mother singing in the nomadic style of Tibet and he attributes much of his passion for that genre to her early influence. ‘…in the between’ brings together four of Australia’s finest multi-cultural collaborators in a highly original interpretation of `The Tibetan Book of the Dead’. Using selected readings combined with musical meditations and sound illuminations, this theatrical and musical experience provides an insight into how we can prepare for the mind’s release from the body and the experiences of ‘the between’. The ‘Bardo Thotrol’ (The Great Liberation through Hearing in the Between) text was originally composed by Padmasambhava in the 14th century. It was buried in central Tibet and later discovered by Terton (treasure revealer) Karma-Lingpa. “Although this book is ostensibly written for the dead, it is in fact about life” Francesca Fremantle (author of Luminous Emptiness and co-translator with Chogyam Trungpa of The Tibetan Book of the Dead). Further info about Trikaya here.